Designed to be mounted on machines and sections of conveyors which cannot be protected by guards. In contrast to traditional mushroom head type emergency stop buttons, Grab Wire Safety Rope Switches can initiate the emergency command from any point along the installed rope length and provide robust Emergency Stop Rope Pull protection for exposed conveyors or machines. In combination with a dual channel safety monitoring relay IDEM’s Guardian Line Series Grab Wire Safety Rope Switch System can be used as emergency stop devices monitored for up to Category 4 to EN 954-1 or PLe ISO 13849-1. All conform to ISO 13850 and IEC 60947-5-5 and they have a positive mechanical linkage between the switch contacts and the wire rope. The switches have wire breakage monitoring. 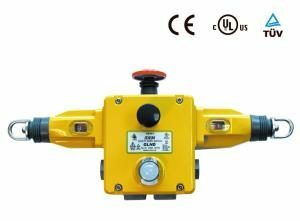 On pulling the rope, anywhere along the length, the safety contacts are positively opened and the auxiliary contacts are closed. The switches are mechanically latched and can then only be returned to the operational condition by pressing the blue reset button as required by ISO 13950. An optional 2 color LED indicator is available to enable switch status to be viewed from a distance.